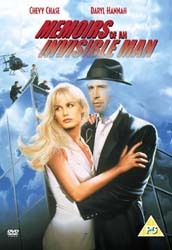 Memoirs of an Invisible Man has not aged gracefully. The effects look dated, but possibly the biggest crime is Daryl Hannah's wardrobe - why did anyone ever think leggings looked good? While the effects look old hat by today's standard, they were pretty cutting edge for their time. There are impressive moments, including watching the invisible Halloway smoking, standing in the rain, and - with his face covered in make-up - as a floating head. Sam Neill is well cast as the sleazy CIA man hot on Holloway's heels and Star Trek: Deep Space Nine fans will be pleased to see Rosalind Chao (who played Keiko O'Brien in DS9) as Halloway's secretary. Michael McKean (This is Spinal Tap's David St. Hubbins) also turns in a pretty good performance as Halloway's friend. The extras are pretty poor and total less than ten minutes - although I'm sure the nurses in lingerie dream sequence will appease quite a lot of people. While this movie is far from perfect, it's still good family entertainment - just not one of John Carpenter's better movies.